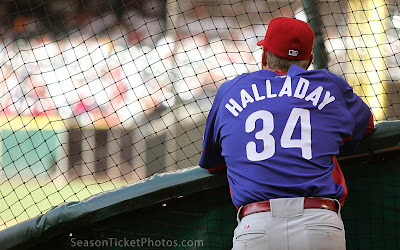 Zoo With Roy: So Roy Halladay Pitched Yesterday (4.16.10 vs. Marlins), PLUS pictures! So Roy Halladay Pitched Yesterday (4.16.10 vs. Marlins), PLUS pictures! It's only been three games and already we're running out of adjectives and original ways to describe Roy's every fifth day. Roy basically dominated the Marlins last night, cruising through eight efficient, rain-soaked innings. He did allow a solo homer to the Marlins' slick-fielding meathead Dan Uggla, but other that he was great. Roy threw 100 pitches, 70 of which were strikes. Ho hum, another day at the office. Halladay's ERA now sits at a ridiculous 1.16 on the year, and his GROwl, according to my super computing algorithmic capacitor (a circa 1996 TI-82), is actually approaching UNDEFINED. We could really get used to (and spoiled by) this. Thank heavens there is a bolg around to document this sort of thing for posterity. It was only a matter of time until one of these made an appearance. 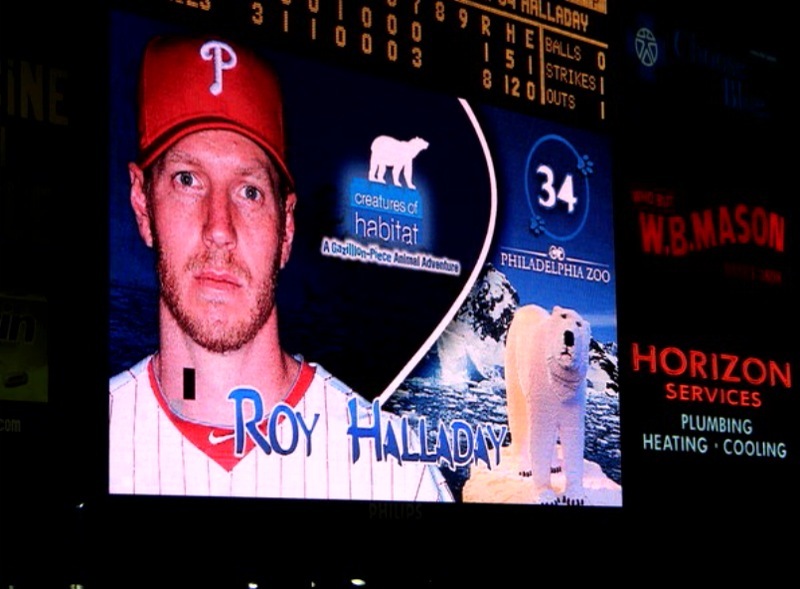 Here's a scoreboard picture of Roy with a Lego polar bear--these are part of a sponsorship that the Philadelphia Zoo has with the Phils, and frankly we can't think of a more perfect corporate sponsor for Roy's gigantic game face. Thanks to Michelle O'Malley and BaseballLadies over at Chicks Dig the Long Ball for the submission! This is no mere coincidence, people. And finally, this ZWR EXCLUSIVE, face-breaking picture of Roy peering into an animal cage through the batting practice screen was sent by Andy from SeasonTicketPhotos.com. Andy is a professional sports photographer out of Austin, Texas, and a huge Phillies fan. Go check out his site, the guy knows a thing or two about sports photography. every 5th day is like christmas eve to me. i can't sleep no matter what i try (5th of vodka) because all i can think about is roy up on the hill dominating lineups. it's the anticipation that kills me. i know i'm getting a present under my tree, i just want to know how awesome it's going to be.